The US army has invested $32.8 million in its own videogame, which acts as both a recruitment tool and PR drive for America's military, it has been revealed. 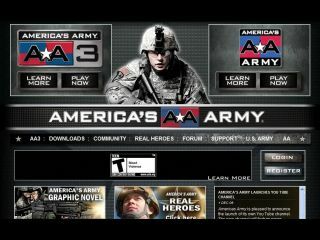 America's Army is, according to its website, "the Official US army game (AA), which provides young Americans with a virtual web-based environment in which they can explore an army career". The game looks professionally made and even has its own YouTube channel – in short, it's got that high-gloss sheen you can only get when money has been spent. And, it turns out, millions of dollars have been spent on the game. Millions of tax-payer dollars. Under the Freedom of Information Act, Gamespot asked to see just how much budget the US is blowing on the game, and it turns out that in its nine-year existence over $32 million has been spent, with $3,395,782 spent in 2009 alone. America's Army was originally touted as a five-year project, but nine years later the game is still going strong and is now on its third incarnation. As a recruitment drive, it does seem to be working. Back in 2008, MIT did a study that found that 30 per cent of all Americans age 16 to 24 had a more positive impression of the army because of the game and the game has had more of an impact on recruits than any form of army advertising before it.